Landview Associates offers the full range of landscaping services, from design work to the installation of decks, fences, arbors, retaining walls, patios, pathways, turf, plantings, and water features. Landview Associates offers free consultation to help customers focus on what their particular needs and desires are for their outdoor spaces. A well-developed landscape will be both beautiful and functional. For example, do you have children or pets that you would like to take into account when we design your landscape? It is often helpful to think of the various sections of your yard as rooms. You may want a deck for entertaining, a section for flowers, a waterfall or pond, an edible garden, or a grassy area for your children to play. Those elements, along with the rest of the infrastructure such as walkways, arbors, fences, and walls will work together to complete your outdoor spaces. To get started on your project, we generally recommend a master plan which details the elements that you would like to see incorporated into your outdoor rooms. From natural stone to manufactured pavers, from brick to tile, we work with the client to determine the best material for their patio, pathway, and walls. Functional and beautiful, there is much to choose from. Stone often forms the backbone for your design from which the rest of the yard is borne. Landview Associates is highly skilled in wood craftsmanship. We will create the deck of your choice and will build arbors and fences creatively and to your specifications. Water features are often added to a landscape to help complete the atmosphere of your outdoor room. Not only beautiful and relaxing, water features compliment the rest of your design, helping to bring it to life. Selective and skilled plantings are vital; they finish the project and augment the beauty found in the hardscapes. 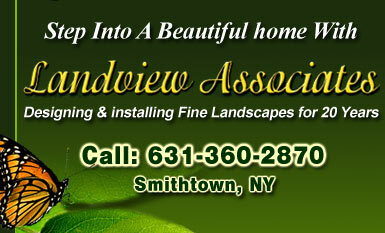 Landview Associates is highly knowledgeable about all types of trees & plants. From broad leaf evergreens and unusual perennials to drought tolerant succulents and native species, we will work closely with you to determine your goals for the space and select plantings based on these desires.